Two of the things that attracted me to Buddhism were its call to accept yourself as you are, right now, and to live life with a healthy sense of humor. I take life very seriously, as is life were an important exam that will determine if I get a good job or am sent to work in the mines. I struggle with self-acceptance, always looking to be a better version of me, the ideal me. As for so many people I know, lack of self-acceptance does a lot of harm. Instead of being a catalyst for self-improvement, lack of self-acceptance has brought me (and others) a lot of unnecessary pain. The constant reel of my inadequacies plays throughout the day, and if I stumble I feel like the world is pointing and laughing. It's hard to be light-hearted when your inner critics are zooming in on you like your Britney Spears' cellulite. I think of the people I really like to be around, like my cousin Mikki. She treats life with a sense of humor and because of this she laughs a lot, and her mood is contagious. I'm not saying she's immune from anxiety or pain--just that she has a healthy sense of humor which makes people of all ages like her and want to be around her. I'm not talking about being a pollyanna type or refusing to take anything seriously at all. M. and I were just talking the other day about how we'd like to cultivate a more optimistic outlook in our daily lives. We both worry and fret about ourselves, about our families, the world--you name it, we fret about it. Also, we come from a generation where snarkiness and cynicism are king and queen, a culture where someone else's trip and fall is a cause for hilarity (it's no wonder we're so paranoid.) Yes, we should sniff out the hypocrites and roast them on The Daily Show, but we should also take note of our own hypocrisy. Laughing at the failures of others is a way to tear the world down, not build it up. It's anti-creativity. Humor that comes at the expense of others makes us no more than a generation of bullies in a schoolyard. And what did those bullies ever do with their lives, besides bullying? Not a whole heck of a lot. 1. Notice and appreciate the little things. My mother does this, beautifully. It just took me 35 years to notice and value this ability. 2. Practice self-acceptance everyday. Recognize that everyone has negative thoughts about themselves but they are nothing more than that--thoughts, not necessarily reality. 3. Find something funny and share it. I'm not naturally funny, but I'm definitely silly, so that's a start. And I don't know anyone who doesn't want to laugh. 4. Help others. Repeatedly. It's a win-win when you give your time and attention to others. It's a chance to take the attention away from yourself, and giving just feels good. 5. Write, write, write! OK, this one doesn't really come from Buddhist thought, but several times writing has snatched me from the depths of my depression. It also helps me to understand the world better. Writing is yet another way to silence the inner critic, to let go and lose track of time, and to create something from nothing. I have to remind myself why I like writing so much so I'll do it daily. I like change when it means a better job, a different vacation destination, a new Ben & Jerry's flavor. Otherwise, change frightens me. It's a constant worry. I may have some things now (a good job, a loving husband, ten fingers to type this blog) but tomorrow something could be gone. Friends I thought I'd have forever are falling away. 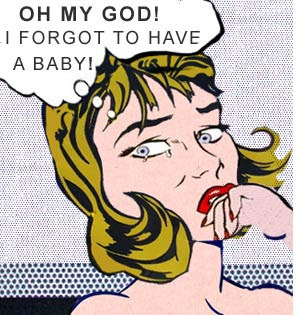 I'm at a time in my life when most of my friends are having kids. M and I aren't planning on having children, and for the most part I'm OK with that decision because there are many other things I want to do in my life, and as wonderful and special as it may be to be a mother (or so I'm told; I mean, who would admit otherwise? ), I am hopeful that there will be other experiences in my life that will turn out to be equally good. The thing that bothers me most about my friends who are in a family way is that I worry about losing them. I know, that sounds wickedly selfish of me. Of course I am happy that they're taking a new step in life, a positive one that will enrich their days in new and exciting ways. Let's face it, having a baby is probably the most momentous thing that can happen to a person, up there with marriage and Cancer. But right now, I have to admit, I view these new children as potential threats. These little ones will be oh-so-cute and oh-so-charming. They will captivate their parents to the point that I'll go months or even years without hearing from them. And when we do talk, what will we talk about? Naturally, they will want to talk about their kids--who said their first word, what Johnny or Mary had for breakfast, or the way Tommy is already reading. And what will I say? Oh, that's great that little Joanie can make a fist--by the way, I went shopping today and got the best bargain on a cashmere sweater! I'm afraid that my friends won't relate to me anymore, will gravitate toward their other friends with kids, or like bubbles, float away into the friendship ether only to be heard from at Christmas when they send holiday photos of their family--"Happy Holidays from the Trumbulls!" --with no personalized note. Or worse, I'll start getting those cloyingly sweet mimeographed newsletters detailing vacations and lost baby teeth, Timmy's first fart, etc, etc. I'll admit, I'm somewhat envious, too. It's like these friends have been handed a key to the same exclusive gated community but when the gatekeeper gets to me, he shakes his head and throws away my key. It's also my fear of change. When change means potentially losing something or someone for whom I care about, I get scared witless. I already feel like I've lost some friends by moving to Boston--I cling to the few who are left, and it's hard to accept that they're changing, too. They're not standing still like friend replicas. They're in motion, advancing further and further down the path, and I'm not there to share it. Worse, I'm not making the same choices as they are, so I feel left behind. It's like when all my friends went to prom and I stayed home filling out college applications. They were in one group (the ones who had been asked to the prom) and I was in the other (the one who was gawky and awkward and too scared to go alone). Perhaps the answer is focusing on the ways that I'm changing, too. Though I'm not having children, I'm learning new skills in a career that I love, I'm finding out new things about marriage all the time, I'm developing a spiritual side, I'm rediscovering the pleasures of helping others who need me. 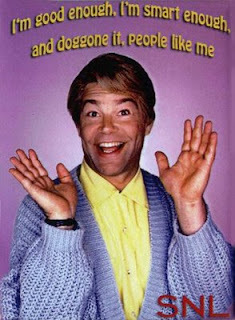 I'm becoming less snarky and cynical and more open to the prospect of a glass-half-full kind of life. These changes may not involve toilet training a child for the first time, but hopefully they will keep me busy and will be good fodder for conversation when my friends get tired of baby talk. Change is inevitable. We gain, we lose, we just have to keep adjusting our sails and our expectations. There is a time at the end of the day that I prepare to leave work. It's always the same--I go into the employee bathroom and reapply make-up and fix my hair. I do this even if I'm just going on the "T" to get home. Often even my best efforts to freshen up don't make me feel any better, but NOT doing this, leaving the office with no lipstick and my hair slightly tousled or flat, would be unacceptable. You might think I'm vain, but I'm not. This is my insecurity knocking. I put on my mask and hope people don't see what's behind it, because I don't think I'm good enough. I've been thinking about what I'm REALLY afraid of and I think it's deeper than a layer of tinted moisturizer. I can't accept any imperfections in myself. My outward flaws are not the only ones I try to disguise. I also feel that I'm not interesting enough, or social enough, or smart enough. I worry that I'm wasting the talents I have and not trying to build up the talents that take practice to achieve. I hate failure, so if I try something and I'm not immediately good at it, I stop and never try it again. Like, for example, knitting. At my job we publish knitting and craft books as part of the overall publishing program. Knitting is no longer just the province of grandmothers everywhere--it's also hot among Generations X and Y. 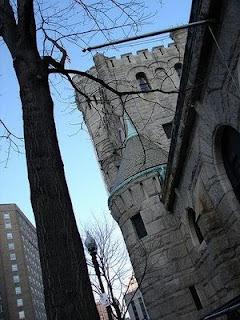 A couple of weekends ago I went to Boston's holiday Bizarre Bazaar at The Castle. I was impressed by all the young men and women who had made unique, arty, handmade items and who were selling them handily. When I go to shows like this (or peruse the craft books) I get excited to work on my own crafty projects. The craft magazines in particular make it look so easy to make a knitted scarf or a bird ornament made of clay and beads. But when I've attempted some of these projects, I've ended up with sad little malformed trinkets that I would be embarrased to wrap in pretty paper and actually give to someone. The one and only time I tried knitting I was with some girls from work. We met up at a bookstore cafe and over soup and sandwiches we set to work. An expert knitter attempted to guide me through the first steps--arranging my yarn on my needles and doing my first drop stitch. I was immediately frustrated as I wound the yarn around and around, never quite getting it right. Others in the group were busy making their hats and scarves and even baby clothes. I had one pathetic line of uneven stitches that was destined for the yarn bag. Eventually I took pity on my teacher and put down the needles in order to finish my soup. Will I try knitting again? Maybe, although I'll probably try to master some other, easier craft to build up my confidence. The thing is, if I felt comfortable with myself and had a stronger sense of self, I wouldn't give up so easily. I'd risk looking slow and inept for the sake of learning, and then maybe after a while of concerted effort, I'd see some reward. But this is just a guess since I've never gotten that far. It's too hard to look at the end result of a project I've worked on for hours that looks like a kid's 1st grade art project. Tonight I meet Linda, a 63-year old woman who lives alone in the same town as me. She's my match from Springwell, a service that matches up volunteers with seniors in need. It took them months to get back to me and I have to admit I'm a little puzzled. My mother is going to be 60 in January and I don't consider her OLD. My mother-in-law is in her early 70's, but she has more energy than I do (for example, she helped my husband carry a heavy bureau up four flights of stairs because I couldn't handle it.) Also, the woman has a job. I was expecting my friendly visits to be paid to a long-retired woman in her 80's or 90's. Why doesn't this woman have anyone to talk to? Is she socially awkward, the term we're using for a parenting book about right-brained children (ie: geeky kids who are good at math)? Is she crazy and therefore can't make (or keep) friends? Has she ever been married? Any kids? If so, surely they must visit her. Of course, all this pondering proves is that I have entered into this volunteer project with an agenda. I expect my lady to be OLD, wizened, wise, so we'll make up the female version of Mitch Albom and Morrie. I expect her to be feeble but full of memories and life advice that I'll eventually record and make into a weepy bestseller. Instead of focusing on the deed itself, I'm looking at what's in it for ME. I'm ashamed to admit that I had a similar agenda the last time I volunteered with the elderly. Actually, it was worse because I was partially there to meet guys. I was in my mid-twenties, single again, and trying to meet that special someone through volunteering. Of course, many other single New York women had the same idea, whereas the guys were not to be found. I did end up meeting a young, cute Dominican who worked as an aide at the long-term care facility. I was volunteering there with a woman named Millie who had lost both of her legs when she was hit by a bus when she was 90. I remember when I first encountered her. The hospital was putting on a dance, playing old records from another era. Millie was in a wheelchair, but beamed when I shimmied her chair left and right in time to the music. After the dance was over she invited me to come to her room to sort through her mail. I got a little information about her life: she had never married or had children, she was a former teacher, she had traveled the world. I started visiting her regularly and that's when I met Manny. Manny and I would take Millie out and wheel her to the park. We didn't know she was aware of our flirting but the next time I came to visit her she pointedly told me "Manny isn't here." I felt embarrassed by how transparent I really was. The last time I saw Millie, she was cranky. When I came to her room, she ignored me for ten minutes as she chatted on the phone to her nephew, whom she insisted was going to take her away from "this place." I wheeled Millie down to the auditorium to watch a movie. It was summer and there was no air conditioning in the room so I started sweating. A woman in front of me in a wheelchair kept rolling her chair back and running over my toes. Later, I took Millie for a ride around the hospital garden. That's when her niece came by. When she saw me and I explained what I was doing there, she called me a mensch and proposed that we set up a schedule of my visits so we wouldn't overlap in the future. Reader, after that day, I never went back. 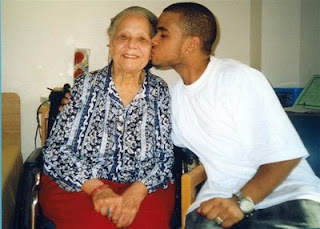 My parents thought I should be spending more time with another senior citizen in my life, my grandmother. But really it was that I didn't want to be held to a schedule. I didn't want to be counted on. Oh, and not surprisingly, Manny and I never went beyond a surprisingly dull dinner date. I guess I got what I deserved. This time, I want to go in without expectations. I want to be helpful no matter what her age or social abilities. Obviously she is in need of a social visit; otherwise, why would she sign up? I can't go into this expecting that if I do good, I will be rewarded. I need to just do it. It's a good time to make amends to Millie by sticking this one out for a while. One recent day I practiced saying "hello" to people I passed on the street in my town. It's always awkward for me to pass strangers on the street--like on the "T," I don't know where to look. I inevitably cast my eyes downward or pretend that there's something fascinating going on at the house across the way. When I said "hello" my voice sounded strange, too soft, and I wondered if I didn't just imagine I'd said something. I didn't get many "hellos" back, so maybe I wasn't getting my message across. It would seem inappropriate to bellow my "hello." I was worried that people would think I was insane or from the midwest. We all walk around like robots, only becoming human to our friends and family. I wanted to connect with my neighbors, even if it was just by saying "hello." My first stab at being friendly to strangers extended into my commute into Boston. I said hello to a homeless guy and bought him an orange juice and gave him a dollar so he wouldn't think I was judging him too much. I said hello to a young boy, and I'm afraid I might have scared him. I forgot that you're not supposed to say hello to strange kids because they might think you're a kidnapper. This "hello" experiment only lasted one day. The next day I was back to walking fast, hands in my pockets, eyes cast downward or away. It was a tough thing to keep up. 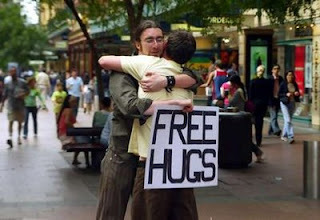 I envy those people who occasionally show up in public places, offering free hugs. How do they deal with all the people who pass them by or laugh, rejecting their hugs, their attempt to bring more love into the world? We're such a cynical culture (and we Gen-X types especially) that someone offering free hugs seems either ridiculous, dangerous, or laughable. As I've said before, I work in a city with lots of college students. One morning I noticed one of these hug solicitors standing outside of Berklee College of Music. Usually there are clumps of young musicians taking over the sidewalk in front of the school in all sorts of weather, smoking and laughing. I don't love walking through this throng because I hate crowds and I'm kind of scared of these students in particular. But this time I stopped in front of the hugger--an African-American music student of considerable girth but possessing a sweet face--and gave him a hug. It was not as weird as I thought it would be, and I had a smile on my face all the way to work. I find it easier to write on here if I have some of Pema's wisdom to contemplate. This is one nugget that is sticking in my teeth. She says, "There is no need for self-improvement. All these trips we lay on ourselves--the heavy-duty fearing that we're bad and hoping we're good, the identities we so dearly cling to, the rage, the jealousy and the addictions of all kinds--never touch our basic wealth." I'm finding myself resistant to this line of thinking. All these years I've heard everything from "Be yourself" to "Try harder and you'll be better." My identity is wrapped around self-improvement, and another Buddhist no-no--hope. My understanding is if you give up hope, you're probably depressed and should get on some meds, stat. Maybe I'm not understanding HOW to abandon all hope. I mean, I know why hope is problematic--it keeps us from focusing on what we have NOW, always looking ahead to the better job, house, car, hairstyle. That makes sense to me. But going cold turkey--I can't imagine my darkest, bluest days without hope bringing me back to life. just to screen shop, of course. But I can see why shopping addiction is so prevalent--it's such a great distraction. Last Sunday M. and my in-laws, T. and D. went to see M.'s Uncle Do in the hospital. Our uncle contracted Pneumonia and then a superbug from the hospital (another reason I hate hospitals--all those free-range germs). He looked like many sick people in hospitals do--their skin ashen, their appearance stark against the white sheet backdrop. They had removed his teeth, which made him appear older and more feeble then I had ever seen him. M told me that he fought in two world wars and was, at one time, a police officer, but at that moment I was having a hard time seeing this. M's aunt L. bantered with him, and for a minute I saw some sparkle come back into his eyes. It's sometimes hard to see the young person behind the lines on an older person's face, but having lived now 35 years, I know that the 20 year-old you and the 28 year-old you, and 30-year old you all still live within you, even at 82. That's what I hate about aging (well one of the things). It's like being mute--you can't fully express who you are inside. The things you once enjoyed go away, and aren't always replaced with new things. Your reward for all your hard work and efforts is a hospital bed with a feeding tube in your nose. It was in this frame of mind that M and I left the hospital and went to Target. There's a running joke among M's family that I LOVE Target, and would give my right arm for just a couple of hours in there along with unlimited purchasing power. M. agreed we'd go there for a mattress cover (which is about as exciting a purchase as the garbage can we bought last weekend. But it's something we needed because the cat kept knocking over the cheap Rubbermaid can we were using). I had visions of cozy flannel sleeping pants, crafty stuff for my homemade gift projects, and maybe a cheap but trendy new purse. But once we got there, and I was wandering the wide aisles filled with stuff made in China, I felt depressed. Commerce usually makes me feel alive, vital, like I'm going to live forever in a state of new and everchanging bliss. But sometimes even a mild shopping addiction doesn't help you escape the fact that you too will be in that hospital bed one day. The good news is that Uncle Do is out of the hospital and has been transferred to a posh rehab center owned by the Masons. Hopefully he'll get the corner room with the view again, with windows on two sides and no roommate. Maybe he'll be able to eat solid foods again, even if it's something junky like donuts. Donuts=hope. They might be all he needs to start feeling better. One of my problems with staying in the "now" is the constant temptation to think about the future. The future used to be a series of events that got better and better, sweeter and sweeter, until everything was the way that I wanted it...I'd live in a spacious apartment in Manhattan (or Park Slope) with my family, I'd be a star employee at Random House and also a published writer, I'd be elegantly thin, well-dressed, and ageless and give memorable dinner parties for friends (memorable in a good way--not memorable because someone falls out a window.) Once I got everything perfect, it would remain so, like a picture of a fresh-faced child who in real time is almost 80. I think it's probably better not to know (or carefully plan) the future. It's a lot more fun to see how things turn out (never as well or as badly as you anticipated). I have to remind myself of this all the time. Otherwise, I sit in the corner, biting my cuticles and worrying about losing something I have or gaining something I don't want! I realize that life is a series of gaining and losing, growing and outgrowing, and that's that. All we really have is the present moment--everything else is a dream.